Reading Skills - Show Me WOW! Children need to be ready to read, whether that is ready to start the process of learning to read, or ready to settle down to a reading session. 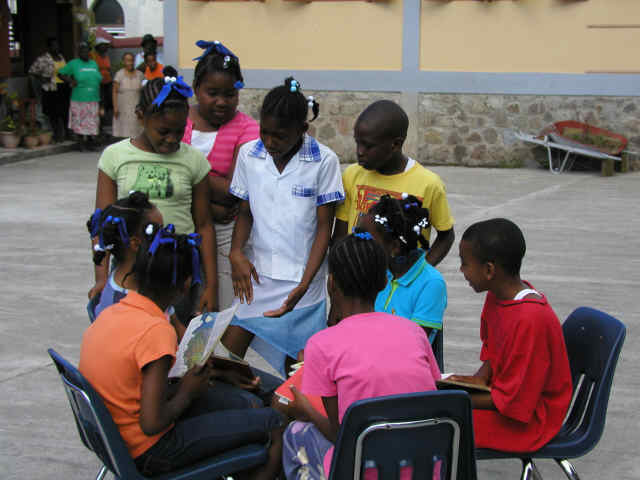 The development of quality reading depends on a number of key points. Whether the text is printed words or the writing on the blackboard, being able to see it is paramount. 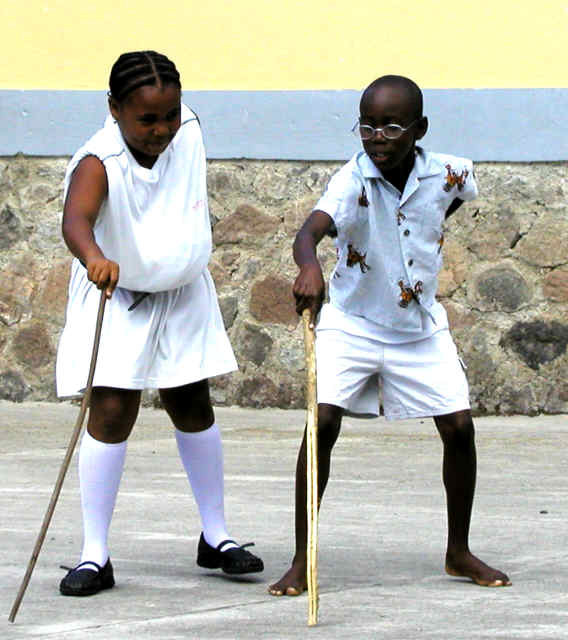 There are very few children in poorer countries who wear glasses, yet many might need to. Families cannot afford them. Allow children to choose a seat best for their vision. Moving them could make all the difference. Be aware that some children are light sensitive and this impairs their vision and distorts texts so that reading, spelling and writing skills are sometimes quite severely hampered. Other children might have different visual difficulties. 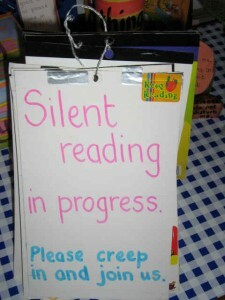 2) Creating the right reading atmosphere and the best reading environment . 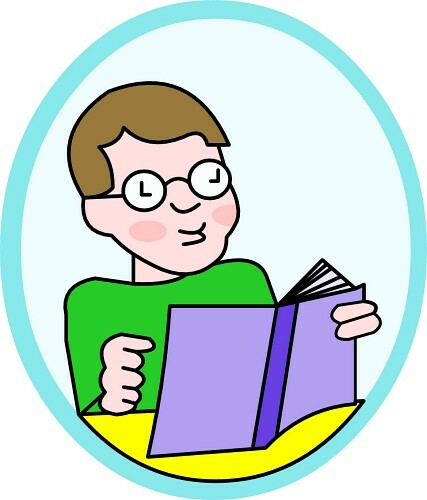 Reading should never be looked upon as a job of work, but as something to be enjoyed and something the child feels good at, even if his attainment in reading is below that expected for his ability and age. A book should never feel so heavy in vocabulary or so weighty in content, that it is not comfortable for the child to cope with! The four finger test is a useful and quick tool to help judge the appropriateness of a reading text. The child attempts to read a whole page, putting a finger down on it for each mistake or long hesitation. Four fingers down before the end of the page and the book is too hard. Choose another book. A standardised reading test gives a teacher a guide to a child’s reading ability, can be used as a diagnostic tool for planning future lessons, and aids the teacher in matching the child’s reading ability with an appropriate reading book. This careful matching inspires reading confidence in pupils. Please note that many such tests can give a guide to reading accuracy but not to reading comprehension. Readability It is very important to match the reading ability of the child with the readability of text presented to him. 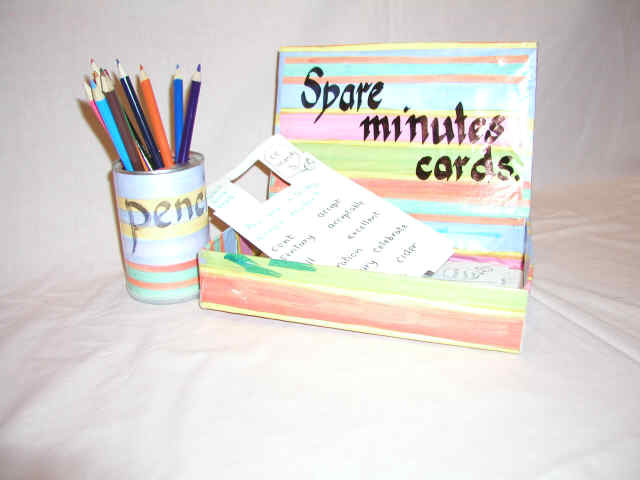 Arrange and label book corner books according to their readability. With the older, but very poor reader, this could mean making books available with a low reading age but with a higher interest age. 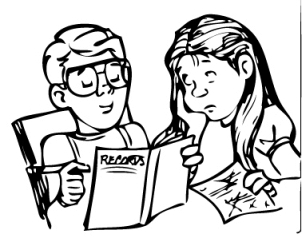 With the younger, more able reader, it could mean matching a book with a high reading age, but with a low interest age. 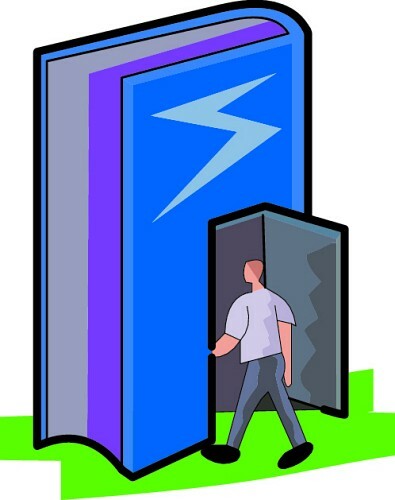 Choosing a book is an acquired skill so don’t tell children to “Hurry up!” and don’t choose the book for them. Suggest and guide though, for how sad it is when a child chooses a book that is far too difficult, and then, does not say “I can’t read this book!”, but says, “I can’t read!” Such children have often predicted the sort of book that adults expect them to read, and consequently aim too high. Or conversely they choose a suitable reading aged book that adults tease or complain is too easy, and the child’s confidence is undermined again. Negativity can kill the appropriate attitude needed to promote good reading skills. 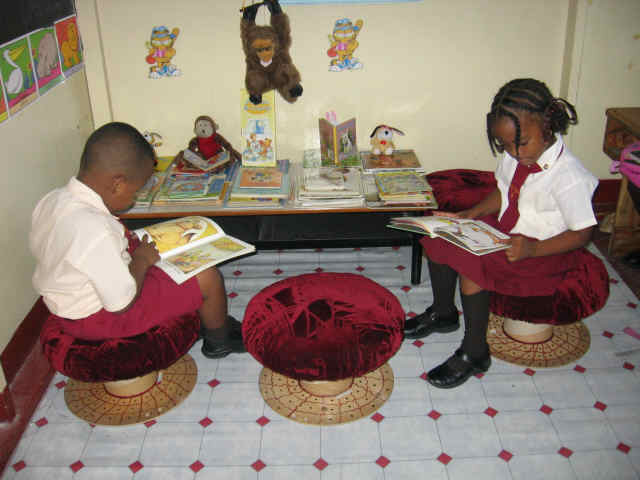 A Book Corner or Book Nook is where the young reader can quietly read, undisturbed by others, with the opportunity to get lost in the pages. If possible, cordon the corner off and supply cushions or a rug or, for the youngest children to sit on or make tuffets as seen below. Children’s reading improves a lot when they have opportunities to stretch out or snuggle up with a book they can confidently read. Display the books so that they tempt readers to pick them up and browse. A book table set with a cloth or some pinned-to-the-wall see-through plastic bags with books in, all make books inviting. 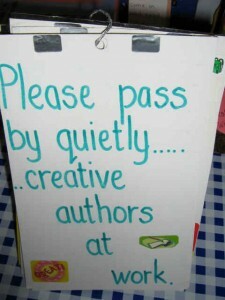 Then allow children to feel can step into the pages and can forget about what is going on in the classroom. 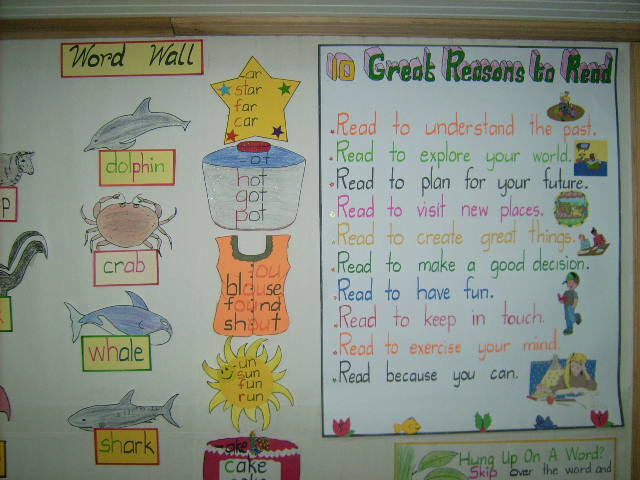 The school walls should promote reading. Charts should be well presented with lettering as close to the reading book’s printed text as possible, (balance of letter sizes, capital letters in the right places, accurate punctuation etc.). 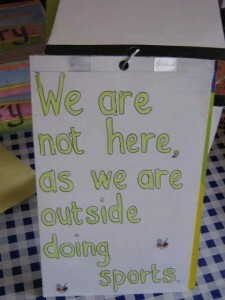 This is because good quality wall displays promote literacy skills, poor quality displays are counter productive. Get on your knees to check your walls’ so that you get the child’s eye view! 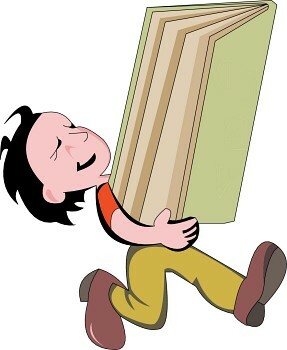 You might be surprised at how much more you can see at your adult height and how little they can see at child height. Change the room, put the charts lower on the walls, even have words on the floor! Charts that are no longer being referred are a wasted opportunity space. Take them down! If a chart is not referred to, children have stopped seeing it anyway. Pencil a date on the chart when you put it up. 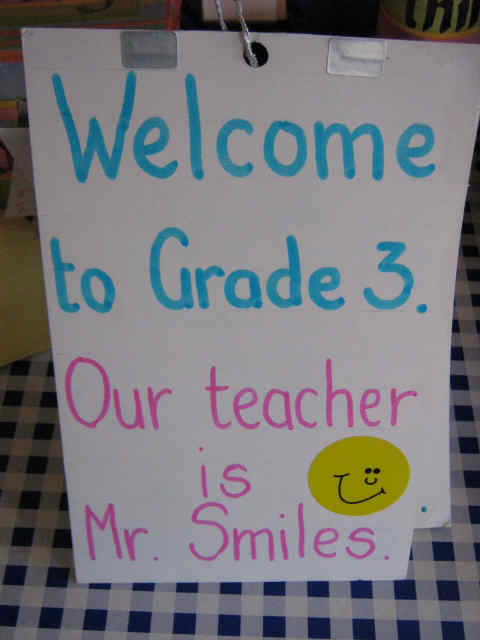 Classroom labels should similarly be clearly written, should often be referred to by the teacher, so that children read them for themselves and refer to them for spellings. For example, if they want to write the word “spare” they know where to find it to read it and then to write it. 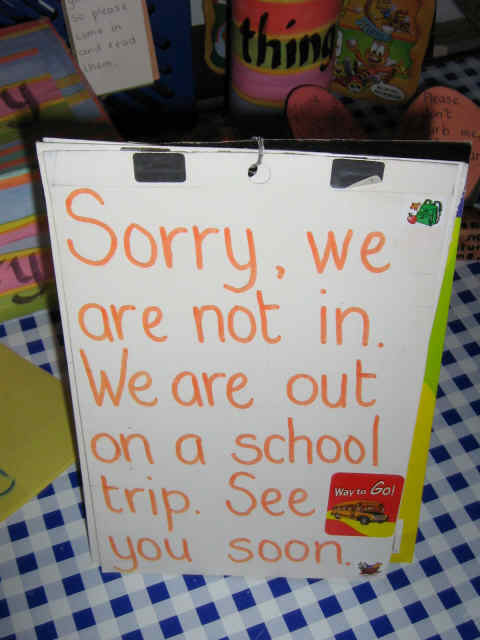 Words around the room give learners an easy way to find their correct spelling. 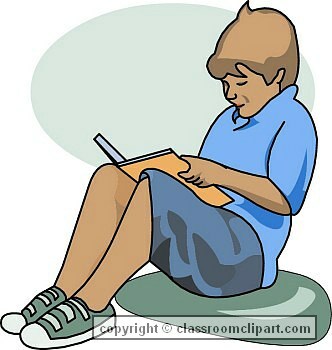 Teacher comments in exercise books enhance reading if written in a style and of a quality that a child can easily read. Otherwise, they too are a wasted opportunity and can deter a child from trying because they deface the work. 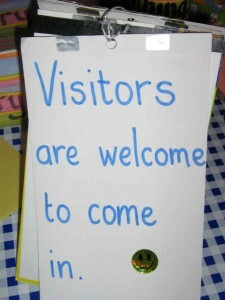 Door knob messages are fun and useful too. Have a collection of these tied with a ring of ribbon or string. 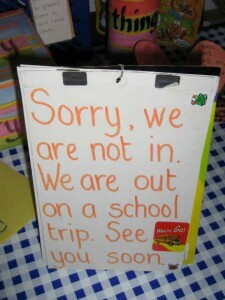 One child could take on the job of making sure the appropriate notice is the one showing. 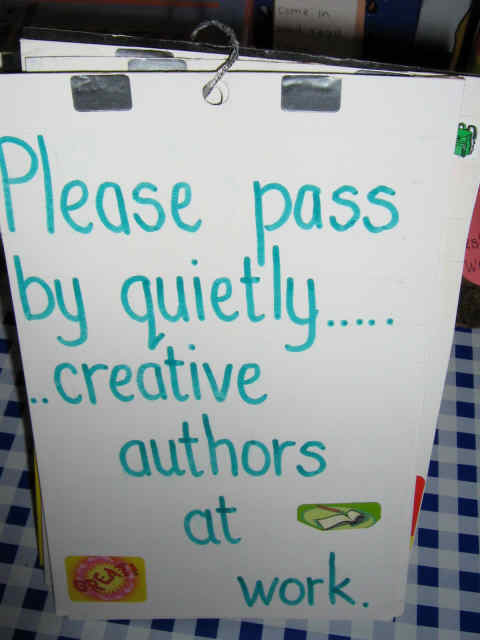 Or below, is a group of polite messages available for children to pick one up from the Book Nook and place by themselves when they do not want to be disturbed. 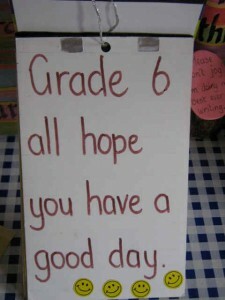 The pupil reads the messages to choose one and the other pupils read it as they pass by him. These on the photograph were stuck on small pieces of tree branch off cuts. Reading each others work. 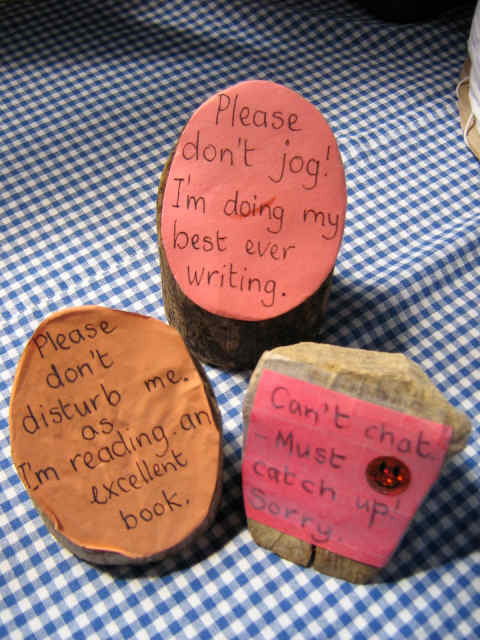 Display children’s written work so others have easy access to it and can take time to read it. 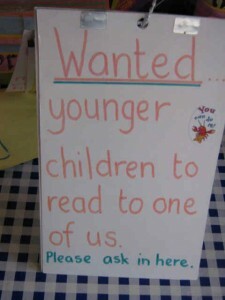 If it bothers you to have children stopping to read work displayed like this, then put such a display in the Book Nook. Shortage of books for your Book Nook? Well remember,children are very good at writing stories for it! write a positive comment about the way the reader read. 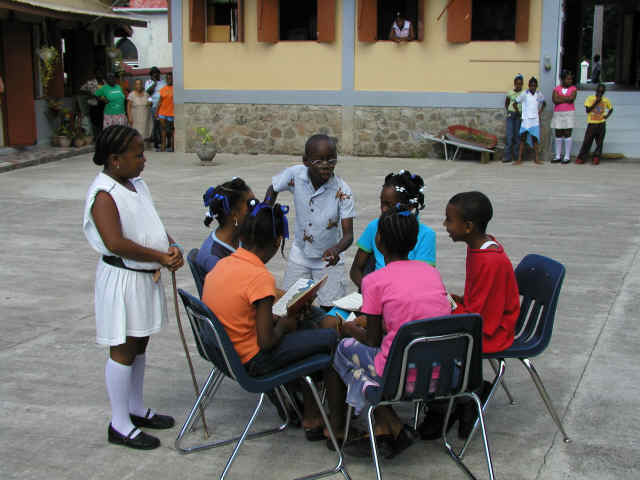 Role modelling Let the children see you reading when they read, even if you do have a pile of marking. Your role modelling will definitely pay far more dividends that your red ink marking! “Reading is so boring! You don’t want to do that! Leave your books and come and play with us”. The readers decide to go on with their reading and the other children go away sulking. An elderly and wise couple, out for a walk, approach the group of readers. They had seen what was happening and had heard the conversation. “Well done, we are so proud of you. Choosing to read is a good thing to do. Parents as partners. Encourage children and parents to get into a shared regular reading habit. 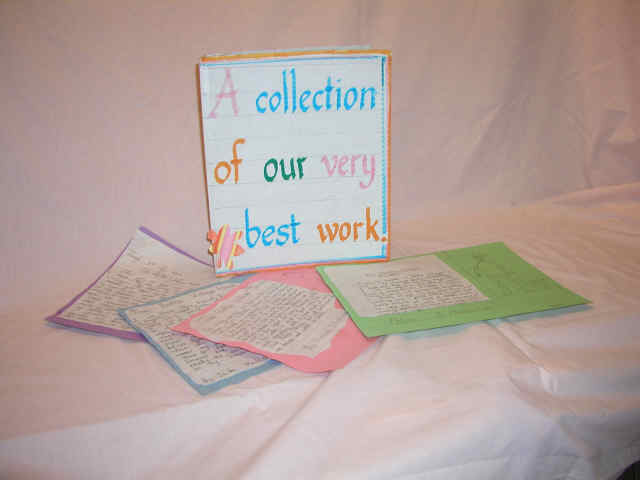 We are pleased that you want your child to make good reading progress and so are sending you these ideas to help. make a habit of regularly setting aside time for you and your child to read together. 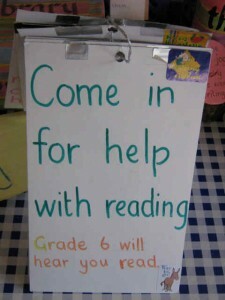 be positively enthusiastic about your child’s reading skills and they will be too. praise them a lot for their reading skills, even if they are struggling. let the child see other family members reading. have reading materials at home and get children to practice reading when you are out and about: road signs, newspapers, notices, television guides, board games. consider joining the library and make regular trips. monitor your child’s progress and don’t over worry if there appears to be a problem. Children acquire reading skills at different speeds. The adult reads aloud at exactly the same time as the child, but when the child approaches a difficult word, the adult says it a second before so prompting accuracy and avoiding the child feeling defeated. The child and adult continue uninterrupted, keeping the fluency of the reading and continuity of the story. This also encourages the child to feel confident about his reading and encourages him to take contextual clues, a skill well worth developing for comprehension and for promoting the enjoyment of reading. Book Nook and, with all the children around, pick up the books one at a time, telling something about the story and ending this description on a cliff hanger. By the end of the session, there will be a list of children wanting to read the books recommended. “Finish the sentence or short paragraph you are reading and, when you are ready, gently close the pages!” Sounds gentle doesn’t it? And so it should be! If the children have just been doing quality reading, they next usually look like they have just woken up! They often feel like having a stretch. Well they may have been up to all sorts of strenuous activities whilst lost in the pages of a good book! And by the way, children who do not have enough practice at silent reading and whose greater percentage of reading time is reading aloud, could end up being very slow adult readers. They silent read at the speed of spoken reading and hear the words in their heads. This is fine for poetry reading, but not so good when they want to speed read! Sadly this is what happened to me!